Published by New Island Books, 2015. 2016 is a year of historical remembrance for the Irish nation as we recall, one hundred years on, events so pivotal to the founding of our state. 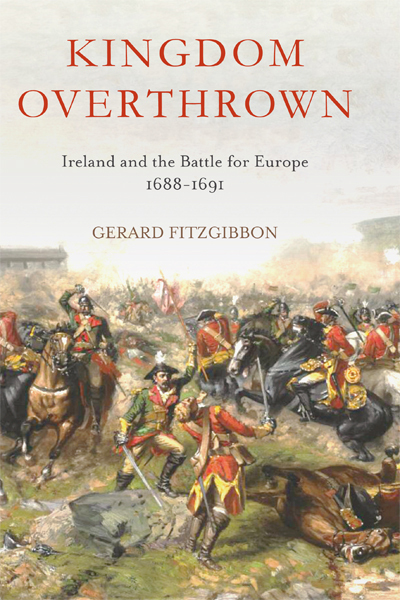 FitzGibbon’s Kingdom Overthrown look at another pivotal, if neglected, period in Irish history: the late 17th Century war for the British throne that was decided, bloodily, on our shores. Time has reduced our collective knowledge and understanding of these events but their legacy maintains a power over the Irish nation. Kingdom Overthrown looks at the late 17th Century war for the British throne that was decided, bloodily, on our shores. British Whig History glorifies the 1688 coronation of William of Orange to the British throne as the “Glorious Revolution”. Works such as Thomas Babington Macauley’s History of England since the accession of King James II inculcated British society with the myth of 1688 as the grand realisation of the Anglo-Saxon values inherent in the British make-up which had been supressed by continental monarchs such as the Stuarts. It was a triumph of liberty over despotism; of religious liberty over Popish oppression. British Conservative MEP Daniel Hannan’s recent work Inventing Freedom: How the English Speaking Peoples Made the Modern World is evidence of the hold that this Whig interpretation of history still has over British historiography (despite being largely discredited amongst academic circles). FitzGibbon’s demonstrates the whitewash of history that the glorification of 1688 involves. It was no “bloodless revolution”. Kingdom Overthrown chronicles the monstrous violence unleashed upon Ireland by William of Orange’s coronation. It tells the tale of those thousands of Irish men who enlisted in the Jacobite cause in a desperate attempt to escape the brutalities of the Penal Laws and regain the land Cromwell stole from them. The books does not deal with either the Irish or international political context, instead concentrating on military matters. Those looking for an in-depth analysis of the factors leading to the incredible moment William of Orange sailed up the Thames and took control of the British Kingdom from the Stuart James will be disappointed with this book. The narrative accepts the validity of the Williamite’s fears of sectarian repression while recounting far more anti-Catholic bigotry than the reverse. Disappointed too will be those interested in the broader context of Irish political life during the period or of the European (or even Scottish) of some of the continent’s defining events of the late 17th century. What FitzGibbon offers is a compelling narrative of the bloody conflict as in engulfed Ireland. Kingdom Overthrown gives an easily read and gripping account of a period that saw Ireland enveloped in war of a scale never experienced before or since. FitzGibbon brings to life the characters of Richard Talbott and Patrick Sarsfield and portrays the sheer brutality of the conflict’s major encounters from Derry to the Boyne, from Limerick to Aughrim. The burning of effigies of Robert Lundy; the Orange Order 12th July marches all stem from the violent period that unfolded as two foreign kings fought for a foreign crown on Irish soil. The grotesque tragedy of these years leaves a lasting impression after reading this book – a good introduction to the period. The grotesque tragedy of these years leaves a lasting impression after reading this book. Irish men who had been stripped of their lands and inheritance by Cromwell, who faced terrible discrimination under the Penal Laws, staked their hopes and dreams in the hands of King James. A weak king with little but contempt for Ireland and its people, who fled to France at the first set back. When all was done and said, the country lay in ruins, the Wild Geese fled and William’s regime imposed yet harsher restrictions on the lives of his Catholic subjects. As FitzGibbon concludes “Catholic Ireland would never rise up for a King again. From now on, it would fight for itself”. Many of the seeds of Republicanism that would inspire 1798 and eventually culminate in 1916 and Independence were sown in the tragic years covered by Kingdom Overthrown. Anyone seeking an introduction into these events would be well advised to read FitzGibbon’s work.